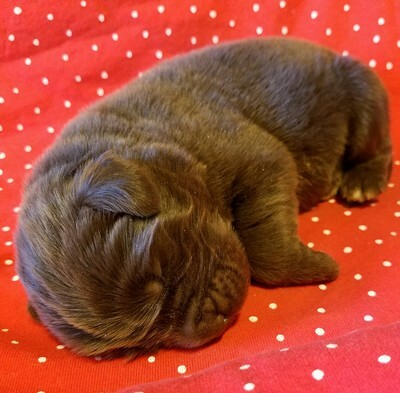 Tenderheart Newfoundlands is a Colorado state licensed and inspected breeder. Our puppies go home at 10-weeks, after their OFA-heart prelim-exam. 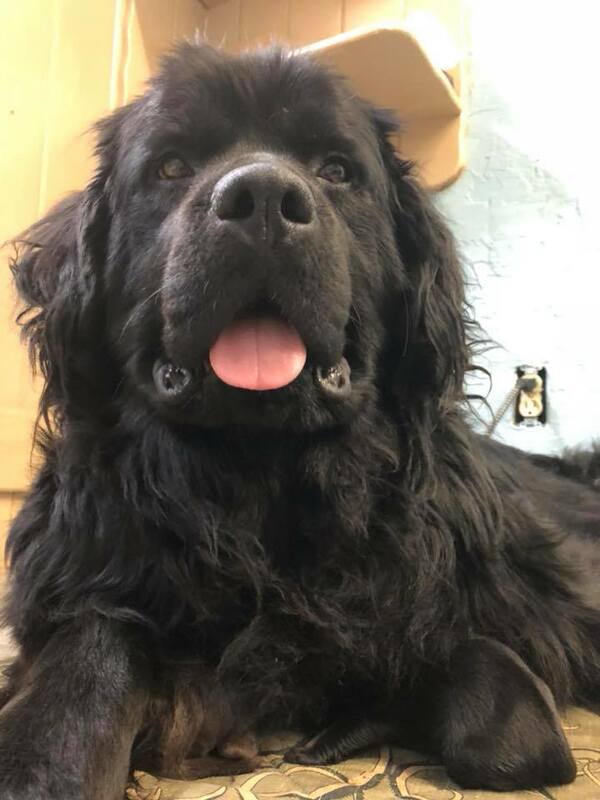 Snapshots of our OFA health certifications and Pennhip ratings can be found on our adults pages; these snapshots are taken directly from the Newfoundland Dog Database online. The Newfoundland Dog Database is an important easy-to-use public information resource, which publicly lists health certifications and other pertinent information. ​ It's not uncommon to hear claims of fake health certs, champion bloodlines, a few missing health certs, or none at all. Major canine breed clubs often recommend breed-specific health certifications; belonging to any particular club is not a replacement for health certifications. It takes just one time for a Cystinuria carrier to be bred to another Cystinuria carrier, to produce affected puppies who are doomed for a shortened life of misery. This is just one of the several serious issues in the Newfoundland breed. Any Newfoundland can generally be found in the Newfoundland Dog Database using its AKC registered name. We have never been partnered or offered our puppies through other breeders; beware of claims from those who pretend they're a "Counter-Part" or Co-Breeder to Tenderhearts. Given the false pretense that this is okay so long as one of their breeding Newfs is from Tenderheart is unethical. Breed recommendations for all breeding Newfs include vital Cystinuria testing, OFA Heart (a simple vet check is not the same thing), OFA Hip or PennHip, OFA Elbows and Patella, and OFA Thyroid. While there are no perfect bloodlines, continual testing of breeding Newfs by dedicated breeders is absolutely necessary. We encourage buyers to ask questions, visit your breeder if possible, and to take advantage of the health and pedigree info provided on our pages to help make your buying experience easier. Our Newfs are breed standard in size; our adult Newfs range in weight from 120 lbs. to 160 lbs. Our bloodlines include champions and foreign imports from Hungary, France, Poland, and Russia. 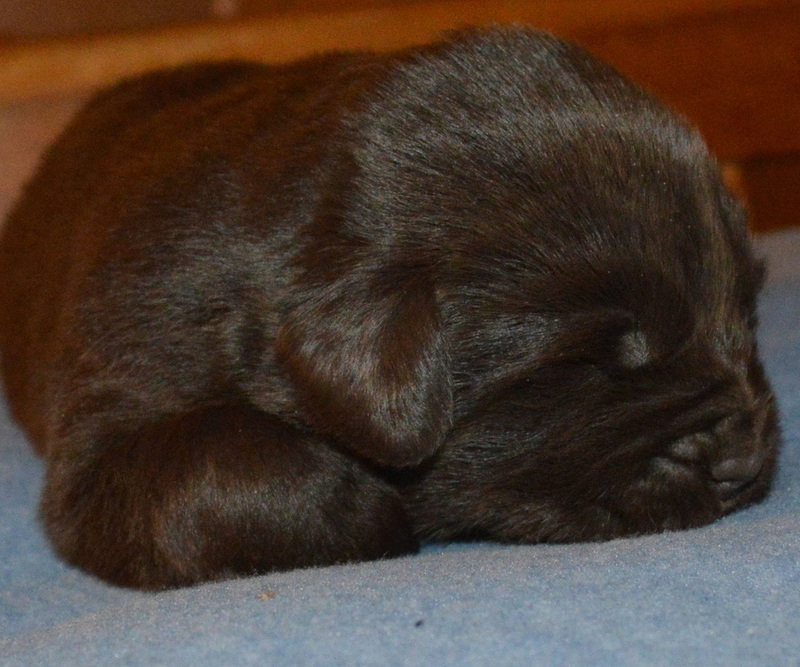 We look forward to producing some exceptional puppies! ​ We encourage all puppy buyers to visit your breeder in person before a puppy choice is made; actually seeing the parents to your pup in person may help you to avoid being highly disappointed later. ​ Visitors are welcome, and we enjoy meeting our puppy families! Please contact us to set up an appointment that will work well for each of us before dropping by. The Orthopedic Foundation for Animals (OFA) is a public resource (see link below), specifically developed for the use of Veterinarians and responsible breeders. We post our certifications online for your convenience on Our Sires and Our Dams pages. We appreciate your patience as we get our pages updated. * OFA Thyroid (Growth/Auto-Immune)............at 12-Mon. ***We DO NOT breed for the dilute colors creme, tan and beige (dilute brown); or gray (a dilute black). These are not "rare colors", and dilute color is not promoted by breed standard. The dilute gene is a genetic defect, often carrying serious fur quality issues such as hot-spots & bacterial skin infections, poor discolored coat with thin/balding fur on the ears, head, legs and tail; especially visible in photos of older puppies and adult Newfs. ***The Newfoundland Club of America and AKC have created the "Breed Standard" in an effort to preserve the better qualities of the breed. 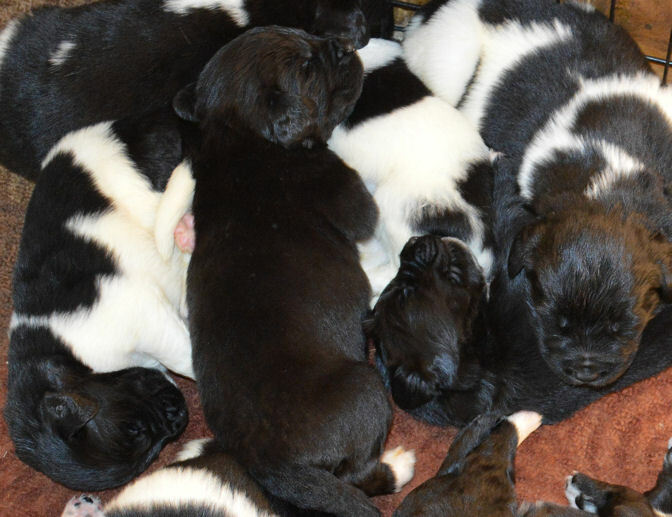 Not all breeders share this same commitment to the breed, and not all Newfy puppies will carry better qualities. PLEASE CLICK ON PHOTOS TO ENLARGE! ​PLEASE CLICK ON PHOTOS TO ENLARGE! ​Landseer and black puppies are expected. 3rd pick...............................(male Landseer)...Becky and Jared L.
Due to the quality of our bloodlines and the large amount of health testing most of our bloodlines go through generation after generation, we are extending our Health and Genetic Guarantee to 2-Years (Please see our Health Guarantee page). Our 2019 Limited Registration adoption fee is $2,300. We do offer Full Registration to approved breeders or individuals, our 2019 Full Registration fees start at $3500. Deposits are non-refundable. litter health check. Microchip ID (seamless 100% non-toxic bioglass encapsulated transponder) is also provided as permanent identification should your Newf ever become lost. Feel free to email, text, or call us with any questions.